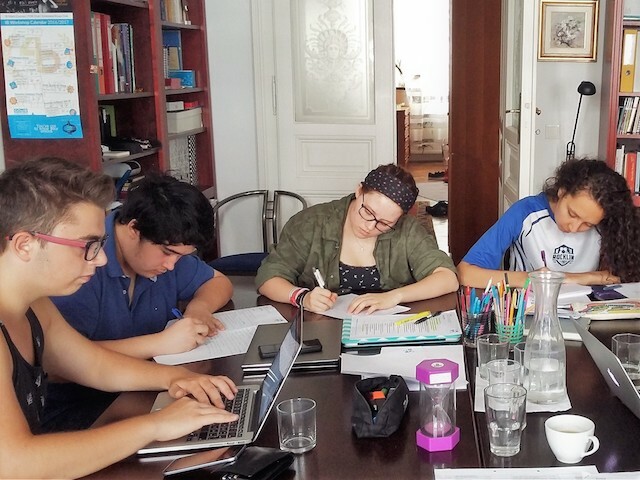 The Extended Essay as a core component of the International Baccalaureate Diploma Programme. It requires the students to conduct independent, self-directed research on a topic of their own choice and to produce a formal piece of academic writing based on their research. These skills are fundamental for all kinds of academic writing, not just the EE. However, at the stage they are required to write their EE many students feel overwhelmed for the first time: as young researchers they often have a hard time acquiring these skills and managing the tasks all at the same time. This comes as no surprise − the Extended Essay is after all the most complex written assignment they will have to complete during their IB programme. This is where the EE Club can help, a workshop we designed specifically for students writing their Extended Essay. The EE Club gives students the opportunity to learn these essential skills providing them with the know-how necessary for writing an excellent Extended Essay. So, who is the EE Club for? All IB students working on their Extended Essays are welcome to join, irrespective of their subject or topic. We work in small groups of up to eight people. The workshop is suitable for students at different stages of writing as everything we learn is relevant for the entire research/writing process and the exercises we do are easily adaptable to the students’ individual needs. is a course we specifically created for giving you a head start on your Extended Essay. It usually takes place over a span of three days towards the end of grade 11. This means that as you go into the summer break you will have completed the first stages of the planning and writing process for your EE. And that will give you plenty of confidence to continue independently with the work on your EE over the summer. then the Early Bird EE Club is just right for you. Join in and get going with your Extended Essay because the early bird catches the worm. We will meet up on three consecutive days for three hours each to discuss our research question and methods, create a well-structured outline, a clear and valid argument, and do some serious writing! will write the introduction to your Extended Essay. Most importantly, you will get a great idea of how to continue your research over the summer break. Beside conducting individual and group work, you will be provided with individual feedback on your research question, essay structure and action plan by the workshop instructor. Take advantage of the group energy to get into that writing flow and register for the Early Bird EE Club. If you need more support in writing your essay or the workshop dates don’t suit you, book a one-on-one class any time.